My third day in Panama. I had a hot tour guide Jean Pierre who took me to El Valle de Anton. 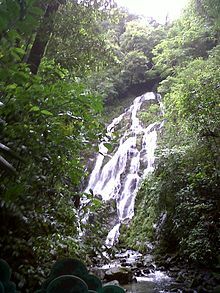 The best part of the trip were the waterfalls and environmental features: including the Chorro El Macho, Las Mozas waterfall, “square” trees behind Hotel Campestre, and a group of small thermal pools (which consist of three cement pools of mineralized water that varies in color depending on the specific minerals present at that moment). The area around the town is one of the last habitats of the endangered golden frog. El Valle has one main road, called Avenida Central or Calle Central, which runs east-west across the town. A main landmark is the town’s public market. Tonight I sleep in the rainforest.